It has been well over ten years since JoJo released a full length official studio album which was The High Road & after the unveiling of last years tringle, fans have been waiting for more music to surface. Today, the singer took to her instagram to reveal a very surprising photo that can be deemed funny, but also gives a sense of relief for her fans/supporters. 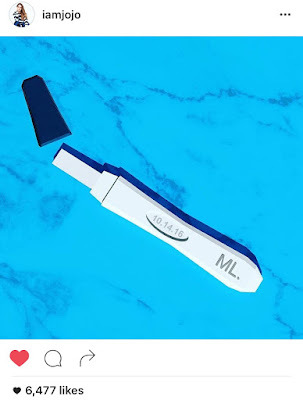 The picture is of a pregnancy test that has the date of October 14, 2016 plastered on the screen & also has the letters 'ML' on it as well. The letters could possible be the name for the album, especially since a new single is expected the debut a lot sooner then many think.